Including A Special Th.A.L.C.O. Thursday Edition! Friday Awesomely Live Co-Op took some interesting twists the past few weeks. If you haven't noticed, the three of us are super dads, and sometimes dad duties or other family things get in the way of F.A.L.C.O., but the show must go on! I found myself with no co-hosts a couple weeks ago, and that would be fine if this were So-Loptimus, but alas, we are Co-Optimus, so I did what every super dad does in this type of situation: con their kids into work. Of course "work" is a relative term, my kids were actually very excited to play Never Alone with me in front of potentially millions of people (potentially). What suckers! Anyway, that brings us to episode 4 of Friday Awesomely Live Co-Op: Never Alone With Kids. My adorable daughters, Payton and Emma, set aside a little over an hour of their busy schedules to play an awesome co-op gem called Never Alone. It's breathtakingly beautiful, has adorable characters, has a touching story, and is chock full of educational video clips about the Iñupiaq Alaskan Native tribe. Never Alone a great game to play with your kids. Next up is episode 5 where we tackled a couple more chapters of Trine 2 during a special Thursday edition we called Th.A.L.C.O. because F.A.L.C.O. just wouldn't have made sense. The first was Searock Castle, which was an amazing spectacle! The level design in Trine 2 is incredibly beautiful and it really shines when objects in the background interact with the foreground. Jumping on chunks of stone buildings while an enormous octopus moves them around with its slimy tentacles is a sight to see! The next chapter, Eldritch Passages, took us deep underground and had us performing some interesting co-op maneuvers to avoid slime that was straight out of an 80's Nickelodeon show. 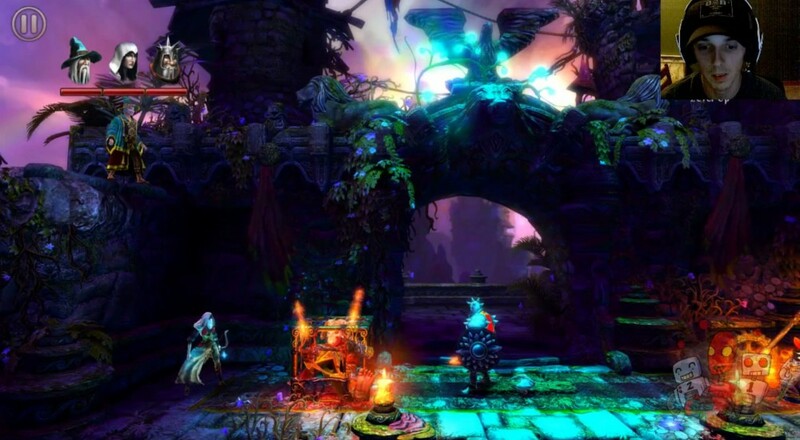 Tonight, we're hoping to wrap up the final two chapters of Trine 2. We'll be live (and awesome) on our Twitch channel at our normal time, 9:00 PM Central. Hope to see you then! Page created in 0.7137 seconds.